This reflective study journal helps you catch the vision for the unengaged and unreached peoples of the world. 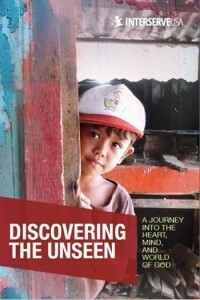 Discovering the Unseen first examines God’s heart for the nations, and then presents personal stories from the Hindu, Muslim, and Buddhist worlds. This study journal can be done individually or used by small groups (Sunday School Classes or evening fellowships). It includes daily questions for individual reflection, and weekly group-oriented activities. We are happy to send copies to addresses within the continental United States. Postal costs prevent us from sending them beyond those borders. We hope you understand! If you leave your name and email, we'll contact you.